Homemade banana chips are an inexpensive, healthy, and easy snack that are great with a number of foods. Toss them into your morning cereal, mix them with your favorite granola or trail mix blend, or eat them plain as a snack. We even like using them as chips to scoop up seasoned yogurt or peanut butter. 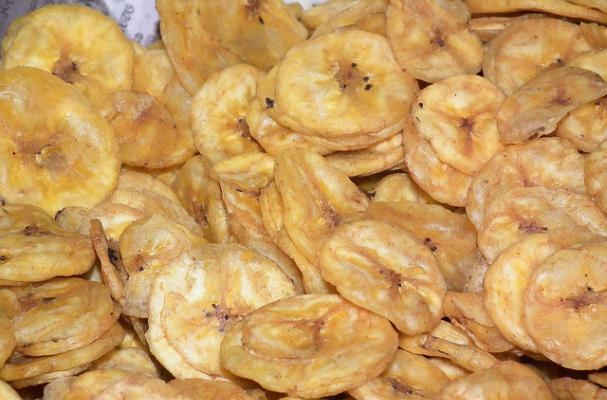 You can make these banana chips in a dehydrator or bake them in a low temperature oven. To get even banana slices, use a mandolin slicer which can be purchased at any kitchen appliance store or here on Amazon. Before placing the bananas in the oven, brush them with a honey lemon syrup to help caramelize the banana. These DIY banana chips are a sweet treat that are so good and good for you! 2. Prepare the bananas, honey and water. 3. Cut lemons in half & set aside 1/2 of the lemon. A tip we were taught by our grandparents is to roll the lemon then cut it, to get all the juices flowing to the center of the lemon. This will help you recognize if the lemon is dry and will cut down on the labor process of actually squeezing the lemon. 4. Prepare a sheet of parchment paper or a silicone baking liner. 5. Boil water on high. Once it comes to a boil, add the lemon and honey and let it simmer. 6. Stir consistently on low heat. 7. Slice the banana thinly, we recommend a mandolin slicer because it chops the bananas super thin, otherwise, use your own judgment and slice with a knife. 8. Place on a baking sheet, making sure that there is plenty of space in between slices, otherwise, the bananas will stick together. 10. Bake for 1-2 hours depending on the oven and how thick the slices are. The longer the baking time, the more the banana dehydrates. 11. Let it cool for 20-30 minutes, the chips will harden as they cool.